Mining batteries is much more profitable than mining the ground, says American Manganese. Almost 14,500 kilometres from the dusty Congo savanna, miners have hit on an entirely new source of cobalt -- the rare mineral at the heart of the electric-car boom. And not only can they take coffee breaks, when they take a break, they can grab a donut at Tim Hortons. Scientists working for American Manganese Inc., located in the suburbs of Vancouver, B.C., in Canada, have developed a way to produce enough of the bluish-gray metal to power all the electric cars on the road today without drilling into the ground: by recycling faulty batteries. It’s one of many technologies that entrepreneurs are patenting to prepare for a time when electric cars outnumber polluting gasoline engines, turning the entire automotive supply chain upside down in the process. Instead of radiators, spark plugs and fuel injectors, the industry will need cheap sources of cobalt, copper and lithium. Innovators like him have made so much progress that the likes of Tesla Inc. and Toyota Motor Corp. could count on recycling for 10 per cent of their battery material needs through 2025 if companies roll out large schemes, according to Bloomberg New Energy Finance. That will ease pressure on lithium and cobalt, whose prices have more than doubled in the past year. Finding new sources of cobalt, in particular, could be a game-changer because more than half of the relatively rare metal is sourced in the Democratic Republic of Congo. Not only is it one of the world’s poorest countries, doing business there is tough after decades of violence and corruption. Some artisanal mines still use child labor. 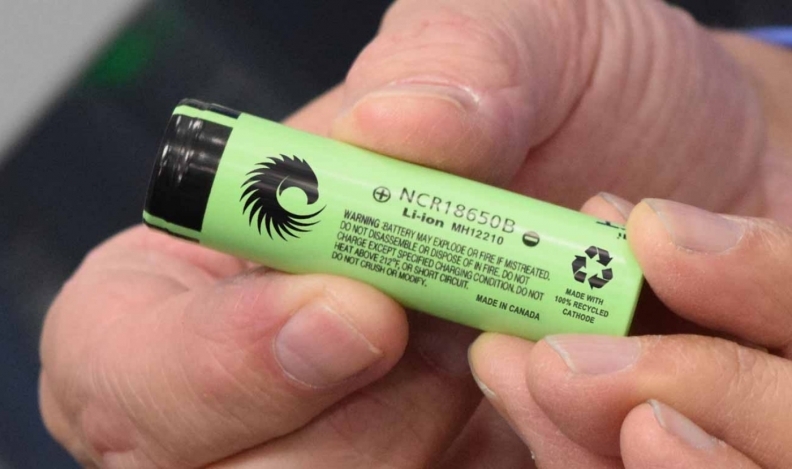 American Manganese wants to recycle the one in 10 lithiumion batteries -- used in everything from home electronics to smart phones -- that fail quality-control tests and end up in hazardous-waste dumps. Doing this could yield as much as 3,600 tonnes of cobalt, according to Reaugh. If true, that’s equal to the material used in all EVs on the road this year. 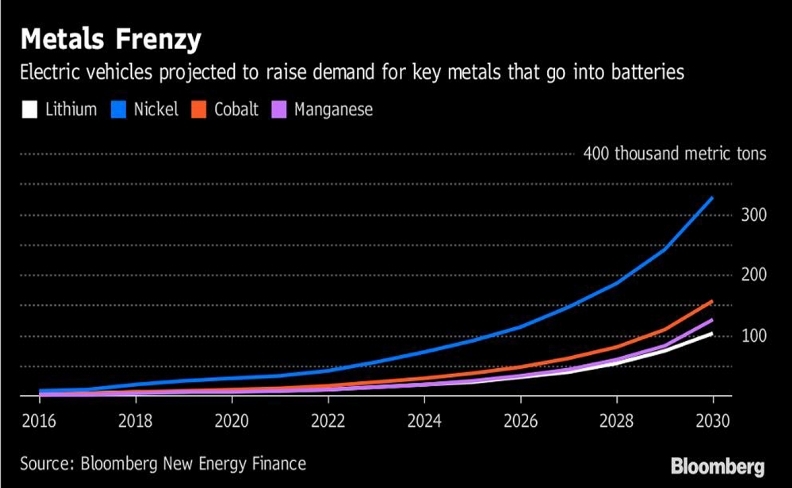 Add in the 311,000 tonnes of electric car batteries that Bloomberg New Energy Finance anticipates will stop working by 2025, and the potential trove of metals grows exponentially. Recycling could have a “stabilizing effect” on battery metal prices, said George Heppel, a consultant at London-based commodity analysis company CRU Ltd. The demand for several metals is expected to rise due to electric vehicle production. After surging from US$10 to US$30 a pound in less than two years, cobalt’s price gains are poised to slow to US$32 by 2021 and US$41 by 2022, according to forecasts of Macquarie Group Ltd., one of the largest banks in commodities. Pressure on lithium, sourced mainly from Chilean brine lakes, will also abate as new supply starts getting produced in Argentina and Australia. That doesn’t mean miners like Glencore Plc, the world’s top producer, will need to scale back production. As the number of electric cars on roads from Shanghai to Paris surges from 2 million now to 118 million vehicles by 2030, demand for cobalt will soar to 156,000 tonnes. By then, cars that emit less greenhouse gas than combustion engines will be everywhere. The U.K. and France plan to outlaw the sale of gasoline- and diesel-powered cars by 2040. China, which is tackling one of the world’s worst air pollution problems, aims for electric cars to make up 10 percent of new sales in two years. To really live up to their Paris Agreement goals for mitigating global warming, though, governments need to ensure that car batteries -- in some cases weighing more than 500 kilograms -- don’t leave a big environmental footprint when they die. At the moment, some companies burn expired batteries, giving off a range of toxic gases. Others even bury them in the ground. “We expect recycling will take off in 10 to 12 years when the first wave of electrified vehicles will near end of life,” said Marc Grynberg, CEO of Brussels-based Umicore, one of the few companies capable of recycling electric-car batteries at an industrial scale at a plant in Belgium. Umicore has agreements with Tesla and Toyota to recycle their expired batteries in Europe. It uses smelting to recover minerals to make cathode materials -- the part of the battery that houses the chemical reaction and produces the electron. At American Manganese, Reaugh says he can extract metals at a cost of about US$0.30 a pound and resell them to battery manufacturers for up to US$20 a pound. Electric car batteries are harder to recycle than the traditional lead-acid variety because they comprise many materials and manufacturers often have different ways of building them. This could be a hurdle to rolling out standardized recycling programs, according to Gavin Montgomery, a director of global metals market research at Wood Mackenzie Ltd.
British tech startups Aceleron and Powervault Ltd. are getting around this by transforming dead car batteries into packs that can be used in homes to store renewable energy derived from rooftop solar panels. Umicore and American Manganese say they’ve already overcome a major hurdle -- they can now directly recover lithium from batteries, something commercial smelting hasn’t always been able to do. Reaugh, who spent four decades working for miners of precious and base metals in the Americas and China, is patenting a technique that removes the battery casing with robotics and soaks the cell in a chemical solution for 30 minutes to bring out the pure metals. He plans to raise US$6 million next year to build a pilot plant near Vancouver. “This is an immediate market,” he said.